On 8th February 2011 we held a Royal Gala Dinner at Claridge's Hotel, London in the presence of HRH The Prince of Wales and distinguished guests. Singer Annie Lennox very kindly performed for us. The evening helped to significantly raise our profile and money for children. performed a concert at Farm Street Church, London to raise money for us. On the 28th and 29th March 2012 we held charity art evenings in London, where paintings, photographs sculptures and other works of art inspired by or created in Africa were sold to raise funds for the Trust. Both evenings were a success - we were able to use the funds to help poor families in Zimbabwe. No amount is too small to make a difference in someone’s life. In June an experienced Trustee spoke to the Bulawayo Junior Council about Drug Awareness and encouraged them to take a stand against the misuse of drugs. On 29th September 2012 the students marched through Bulawayo to share their awareness and to oppose drug misuse.The A to Z Trust offered advice and guidance about counter narcotics initiatives. £16000 for the supply of tools, equipment and materials in collaboration with the Bulawayo Trust, Aberdeen to Vocational Training Projects for Motor Mechanics, Home Economics and Catering students run by Bulawayo City Council as a result of which there has been enhancement of the capacity for practical experience beyond theory. Most students progress to a professional qualification and are given work placements which make them suitable for employment when job opportunities arise. The Home Industries Unit in Bulawayo was given funding to repair looms that will enable the employment of five additional women and the supply of material for their money making projects. Mashambanzou Trust, Harare ~ the House for Girls from dysfunctional families and a Crèche at Mbare where 60 infants are cared for and educated to a very high standard in an area of absolute squalor and poverty. Donations to cover the girls’ education for a year and some of the costs for the running of the crèche were made. The Queen Elizabeth Adventist Children’s Home in Bulawayo which cares for orphaned children from birth until 12 years. This is a well run home which A to Z Trust has assisted over the years with donations of clothing and other items for the wellbeing of the children. 2012 marks its Diamond Jubilee. The Haven Trust, Bulawayo – a home for abused women and children was given clothing for its residents and fabric to make curtains to improve the look and comfort of this temporary accommodation. Mboqane School on the outskirts of Bulawayo with the supply of foodstuff for breakfast for children, some of whom have to walk up to 10km each way in order to attend school, and other educational materials which have enabled the re-establishment of a pre-school class. 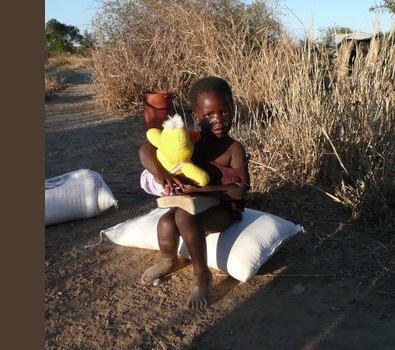 Killarney camp for displaced people near Bulawayo – the supply of one ton of maize and other foodstuffs. The people in this camp have been supported with the distribution of clothing and food by A to Z Trust for several years. Trenance camp for displaced people, near Bulawayo, with the supply of one ton of maize and other foodstuff. The possibility of developing and supporting a crèche here is being explored. The supply of materials for classes for children who would not normally receive lessons in art at the National Gallery of Zimbabwe in Bulawayo together with support for artists in residence to enable them to develop their skills and promote their artwork. In October 2011 we sent 60 boxes of clothing, shoes, books and educational materials for distribution to those people the Trust exists to support in both Harare and Bulawayo and we were able to visit places where people had benefitted from this donation and to ensure that needs were being properly met. The situation for the majority of people remains at crisis level and the need for assistance is vitally important. Even the smallest donation can and does make a difference in the lives of many deprived, needy and oppressed people and both they and we are grateful for all possible help.